Rayman Designer is a PC sequel to the original Rayman game, which features 24 new maps called Rayman's New Levels, and a program called Rayman Mapper that enables players to create their own levels, or play levels downloaded from others. Gameplay in the 24 official levels, as well as new ones created by fans, occurs in the same six worlds as the original Rayman game, but does not involve finding cages and freeing the Electoons inside. Instead, Rayman must collect 100 blue Tings to make the exit sign appear, a task that also involves collecting Tings of various other colours to make other items appear or disappear (most often platforms or blocking sprites, respectively). 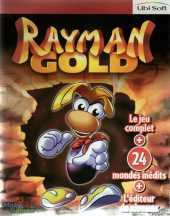 Together with the original game, Rayman Designer is included in Rayman Gold, Rayman Forever and Rayman Collector.